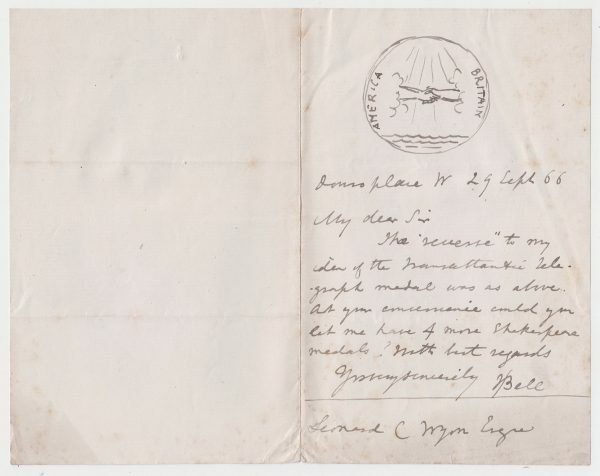 Autograph Letter Signed, to Leonard C.Wyon, asking for more Shakespeare medals, and incorporating a pen sketch of “the ‘reverse’ to my idea of the Transatlantic Telegraph Medal”. 1 page 7 x 4½ inches, in good condition. Douro Place, 29 September 1866. John Bell (1811-95), sculptor, produced the Guards’ Memorial (1858) in Waterloo Place, and the American group in the Hyde Park Albert Memorial (1873). He was also one of the first British sculptors to experiment in the use of polychrome and new materials such as terracotta, which again became popular at the end of the nineteenth century for symbolist and the ‘new’ sculpture. Leonard Charles Wyon (1826 – 1891), Chief Engraver at the Royal Mint, and the engraver of the Victorian era most notable for his work on the gold and silver coinage struck for the Golden Jubilee of Queen Victoria in 1887 and the bronze coinage of 1860 with the second (“bun”) head portrait, in use from 1860 to 1894.